Sleep under the stars from the comfort of your bed with the glow-in-the dark lunar clock. 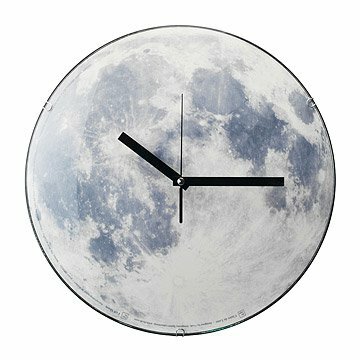 Catch a glimpse of the night sky from the comfort of your own room with this glow-in-the-dark Moon Clock. The clock face features a photographic image of the moon, and its mechanism is protected by a rounded glass cover. The image is coated with phosphorescent paint, so after soaking up light during the day, it puts out a relaxing, ambient lunar glow once the lights are out. Made in China. Requires 1 AA battery, not included. 15 hours of daylight equals 4 hrs of illumination. Comes ready-to-hang. Makes an audible ticking sound. Bought as a gift and he loves it! So unique and useful! He loved it. I gave this clock to my son for Christmas as a tie in gift with a lunar deed. Great fit and and interesting gift. Looks great! Easy to set up and my friend enjoys the moon face in her home! No cold walks anymore! The box this came in made me even happier I purchased it, because it told the story of the product and made me proud to give it. It is beautiful and meaningful to me and the person who received it as a gift. My first one didn't work properly, I.e. it did not keep time well. But I got it replaced and all is good now! when box was opened, the hour hand was loose. Hung it on the wall anyway. It looked real nice next to some paintings of the unviverse we already had on the wall. However, it would not keep time. Needed a clock in my living room and wanted something decorative. It complements my space art and is attractive for the price. The only downside is that it needs lots of daytime light to glow for very long at night; like it anyway.